Last week I met friends for dinner at Pastis in Constantia. I haven’t been here for ages! I used to go there often with friends who lived up the road (at “The Venue” as we called their spot), however since they moved out of there I haven’t been. Since two of us were coming from the burbs and one from Hout Bay we thought this was a good halfway spot. The restaurant was pretty quiet, which is a bit sad because the setting is nice outside on a warm evening (which it was). I decided to indulge in a glass of one of my favourite wine’s Haute Cabriere Chardonnay Pinot Noir, oh my giddy aunt is it yummy delish. Try it next time you can. And then I’m also a sucker for seafood so when I heard there was Bouillabaisse on the menu I thought I’d give it a try. Seeing as this is something I’ve always wanted to make and never get around to I like to eat it when I’m out. 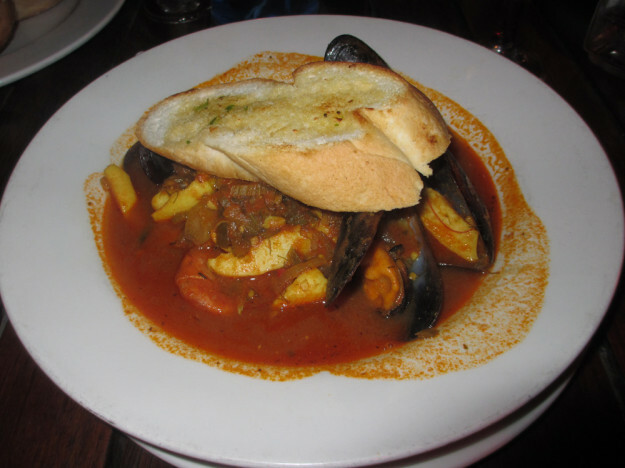 Incase you don’t know what it is here’s a brief description – tomato seafood stew, think mussels, praws, calamari, linefish, onions, garlic and a whole bunch of flavour. This one was pretty good – can’t say it was the best I’ve ever had, but I did eat it all. Company was brilliant and we had a good old natter! Love a bit of conversation with my dinner. Thanks ladies. This entry was posted in Eat and tagged dinner with friends, seafood.